The St. Vincent's Project is currently sold out, but come get on the WAIT LIST! We anticipate many people getting in each night. To put your name on the list, please come to 218 W. 11th St. This is the entrance to St. John's in the Village, where the prologue of the show begins. The audience will travel over the course of the show back to Rattlestick's theater and and then into the streets. House opens 20 minutes before start time. Please pick up your tickets at ST. JOHN'S CHURCH at 218 W 11th St,. Our Box Office will be set up there. A first-come, first-served WAITLIST will form at 6PM prior to the start of the performance, also at the box office at St. John's. Seating in the theater is General Admission. Presented in partnership with the Greenwich Village Society for Historic Preservation, the NYC AIDS Memorial Board, St. Johns in the Village, and the Stonewall Chorale. Written by Cusi Cram, and starring Kathleen Chalfant (Angels in America, Wit), Saint Vincent's Project: Novenas for a Lost Hospital, is inspired by those who dedicated their lives to care and those who were lost. Guided by Elizabeth Seton of the Sisters of Charity (played by Chalfant), the piece theatrically explores the 161-year history of the hospital. This piece uses theater as a vehicle to remember, to honor and to celebrate the life and impact of St. Vincent's Hospital. This memorial is intended both to honor and acknowledge the past and – as the AIDS crisis is far from over – energize and inspire current and future generations of activists, caregivers and people living with HIV. Founded as a grass-roots advocacy effort in early 2011 by Christopher Tepper and Paul Kelterborn, the NYC AIDS Memorial organization is now a 501(c)3 corporation, with an 18 person Board of Directors, chaired by Keith Fox. St John’s in the Village is an inclusive, diverse and welcoming community of faith, centered in the worship of the Holy One with a Spiritual inquiry that seeks to embody God’s reconciling love, coupled with contemporary creative ideas. We seek to be a place where all are welcome as we encounter the living God, through the healing grace of the Gospel of Jesus Christ. We are a community challenged by the transformative power of the Holy Spirit, through worship, music, the arts and joyful hospitality as we reach out to the needs of our world. Saint John’s in the Village plays a meaningful role in the community of the village, the Diocese of New York and beyond. Based in New York City, the Stonewall Chorale is the nation's first gay and lesbian chorus. Our mission is to enrich people's lives through learning and performing beautiful choral music, and to nurture and celebrate the community we create together. 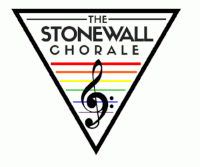 The Stonewall Chorale originated in December 1977 as the Gotham Male Chorus, and specialized in Gregorian Chant and Renaissance music. In 1979, women joined the chorus for the first time, and the name was changed to Stonewall Chorale, the nation’s first Lesbian and Gay chorus.